Floorplans – do we need them? Floorplans are a relatively new addition to property details. Originally they were only made available for either very grand homes, or new builds. Now much more prevalent and even the humblest of studio flats usually have a floorplan on the details. But why are they so important? There are three elements to a floorplan that are important in its usability; firstly, it needs to include measurements. Too many poorly-drawn floorplans often have the measurements missing, or else they are instead included in the written description where they lack context. The right place for room dimensions is in the floorplan, so that a buyer can easily ascertain their relative sizes. Secondly, it should include a compass market, so a buyer can tell which way the front of the house and more importantly, the garden, faces. The last element that should be detailed on a floorplan, is the overall square footage. This allows the house to be compared with other properties, so that a buyer can instantly see how much house he’s getting for his money. In the UK, we often sell houses on number of rooms only, and as a result, room sizes are getting smaller and smaller. These days, a four bedroomed house can take up the same footprint as a three bedroomed property would have done thirty years ago. To be able to see the total floor area gives a buyer the opportunity to ensure he is getting good value for money. 1. 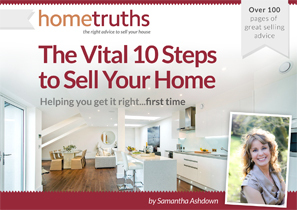 It helps a buyer see how the house ‘works’, and therefore whether it is worth a viewing. Room flow, relative sizes and layout are all factors that a buyer will take into consideration, especially family buyers, and he won’t want to waste time by viewing properties which just aren’t suitable for his needs. 2. A floorplan can help a buyer to visualise the property after the viewing. This can become useful when he may be considering making layout changes, perhaps knocking down a wall or installing an ensuite, and a floorplan is vital for this kind of thought processing. 3. Floorplans can make a house seem larger. It’s very easy when you’ve viewed a house to forget rooms that you’ve seen, or overlook a part of the house altogether. This is especially true of boxrooms, or areas that aren’t being fully utilised, like storage rooms. By showing the house in its entirety on a floorplan, no area will be omitted and as a result, it can even add perceived value. In summary, make sure you have a floorplan on your brochure, and preferably available as a separate download on the online property portals, ensure it is clear and informative, and that it includes the total floor area. Your buyer will thank you for it.